For people who want to watch internet TV play on their standard TV, they can sit in comfortable sofa and select viewing pleasure without walking to computer to change channels or scroll through options by using this mini keyboard remote.For the lecture, sales manager, presenter and others, who can this mini keyboard conduct presentation and operate PC wirelessly from within a 32 foot radius . Perfect for PC, Pad, Android TV Box, Google TV Box, Xbox 360, PS3, HTPC, IPTV, etc. Wonderful mini wireless keyboard with colorful backlit, including red, orange, yellow, green, blue, indigo, violets switch randomly.Backlit function can be used in poor lighting environments, more convenient at night. Backlit on/off: press Fn+Light Key(the key at the bottom right corner). Adjust the color: turn on the backlit, press Fn+FGB,then slide on touchpad select the color. To save electricity, mini keyboard will auto-sleep after 3 minutes without any operating and press any key to wake up mini wireless keyboard. Note: This device requires a USB port to operate. 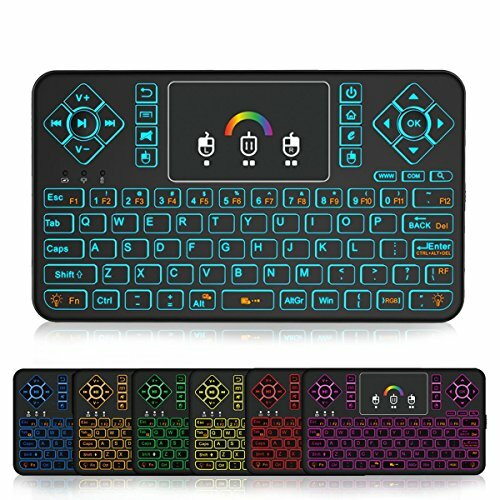 3 in 1 MultiFunction 2.4GHz Mini Wireless QWERTY keyboard and TouchPad combo, LED colorful backlit handle remote with USB interface adapter, perfect for PC, Android TV Box, Google TV Box, Xbox 360, PS3, HTPC, IPTV. 80 keys QWERTY mini wireless keyboard, add multimedia function keys and hot keys, more convenient for typing, searching and remote control. Warranty: please be advised that we offer 12 Months Warranty and 60 Days Money Back Guarantee, order today! Special Notice: This keyboard connect the device via a USB dongle, do not have Bluetooth function, not compatible with iPad, Fire TV and Fire Stick. If you have any questions about this product by OKELA, contact us by completing and submitting the form below. If you are looking for a specif part number, please include it with your message.